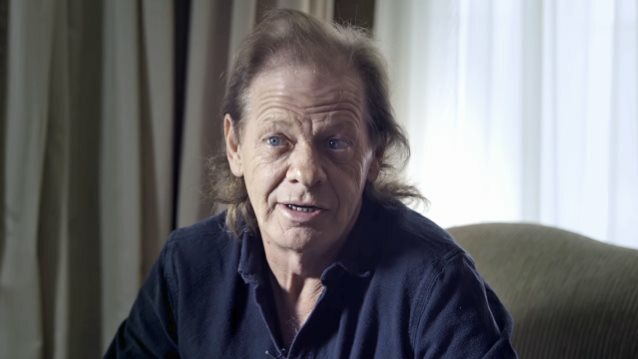 Legendary hard rockers AC/DC have uploaded a two-minute video clip in which rhythm guitarist Stevie Young talks about his playing style and his role in the band. You can now watch the footage below. Stevie Young, the nephew of guitarists Angus and Malcolm Young, took Malcolm's place in the band prior to the recording of the group's 16th studio album, "Rock Or Bust". Said Stevie: "I come from a musical family. My dad and all my brothers played an instrument, mostly guitars. So there was all these instruments [laying] around. You picked it up and played it away. There was always people to show you how to get on with it. "I work out stuff all the time; I keep working away," he added. "Every day I listen and try to find bits that I missed or something that Malcolm did that would help with what's [going on] in the tunes. I'm not trying to imitate or copy him, but trying to keep the spirit of what he did in the band." Stevie Young played with AC/DC once before during a 1988 tour, while Malcolm stepped out to deal with his dependency on alcohol. Legend has it that Stevie resembled his uncle closely enough that many fans reportedly didn’t even know Malcolm had left the tour. AC/DC made it official in September 2014 that Malcolm Young would no longer record or perform with the group. His family disclosed a short time later that he was afflicted with dementia. The guitarist was rumored to have suffered a stroke earlier that year. Asked whether Malcolm Young approved of the band continuing without him after he was diagnosed with dementia, Angus told Sweden's Aftonbladet: "It was Malcolm himself [who said we should carry on]… He worked as long as he could himself [until] he couldn't continue doing it because of his medical condition. So he said it was left to me to keep it going. And the logical choice to fulfill Mal's role on the project was my nephew Stevie. He had filled in for Mal in 1988 and he had done an American tour, a whole American tour, and he did it well." Added bassist Cliff Williams: "He was the obvious choice. And he fills in very well for Mal. He plays very similar — same style, which is hard to find. It's unique — it really is — and Stevie grew up with that, and he plays just like Mal, so he fills in extremely well. [He has the] same type of personality."